In an agile project, the backlog (the prioritized set of requirements) is the main input to iteration planning. 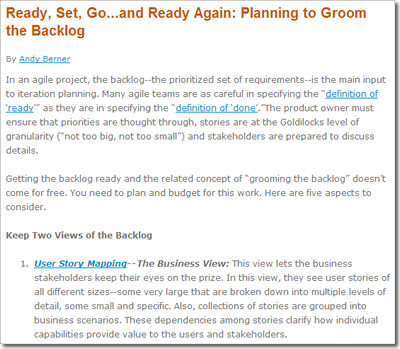 For an agile project to progress smoothly, the backlog must be groomed and ready for each sprint. That work must be included in your project plan. In this article, the second in a series recently published on Projectmanagement.com, QSM's Andy Berner gives you five points to consider when planning that work. Andy Berner is a software engineer and methodologist. He came to QSM in 2012 after over 25 years in both large and small software organizations, including, among others, EDS (now HP), Rational Software and IBM. Based on his experience in almost every role in software development, Andy has consulted with numerous organizations on using software development methods and tools to improve productivity and quality.